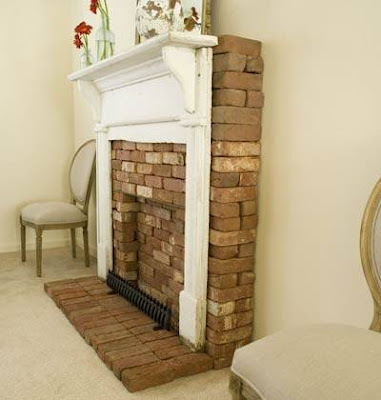 If you are a renter (or even homeowner) use some old bricks and a mantle to create faux fireplace. 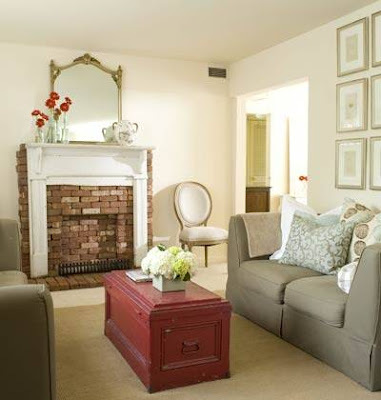 This is great way to make a focal point in a family room or even bedroom, just don't try to start a fire in it. If I didn't already have a fireplace in my apartment I would totally copy this idea. Oooooh, I like that. We don't have a fireplace (we were going to lose 2 windows to have the builder put one in, and I refuse to lose any windows! ), so this is a really interesting option for someone like me. Thanks for sharing! I've never seen that before, but I really like it. It would be a cool thing to add in Master Bedroom and give yourself a faux mantle. Love this idea. very cool. love that you can add it to any room! !